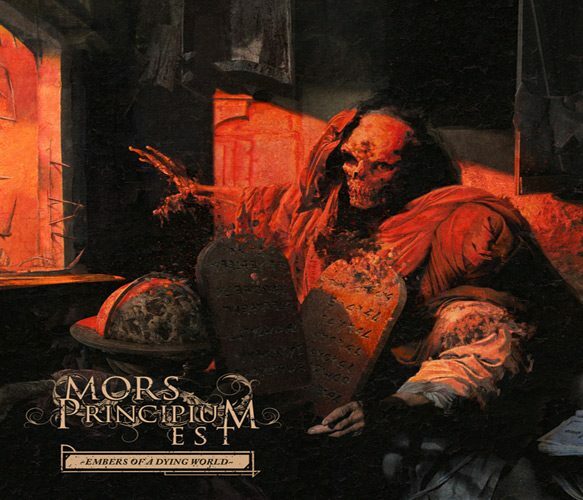 What started as a three-piece band back in 1999, Mors Principium Est were one of Finland’s bright young Melodic Death Metal bands. Standing out among the pack, the band had unleashed their debut album, Inhumanity, in 2003 via Listenable Records to positive acclaim. 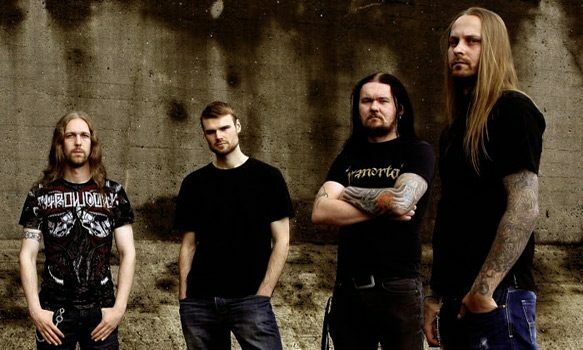 A ground swell of support that grew stronger through the years, 2005’s Unborn and 2008’s Liberation = Termination would see the band reach greater heights. Moving to AFM Records in 2012, the band has undergone many transformations, making them what they are today. None of the original members remain, but the band’s legacy continues with long standing Vocalist Ville Viljanen, Bassist Teemu Heinola, and Drummer Mikko Sipola joined by newest recruit, UK Guitarist Andy Gillion. A four member machine, they return in 2017 with their sixth studio album, Embers of a Dying World. Released on February 10th, the eleven track journey marks their third album with AFM Records. A follow-up to 2014’s Dawn of the 5th Era, their latest effort blends powerful vocals over chilling melodies, making Mors Principium Est a force to be reckoned with. With a name that is derived from Latin, translating to “death is the beginning,” it provides self-inspiration for the record, which begins with a powerful instrumental. Entitled “Genesis,” it sets the mood for the flow of the tracks to follow. Leading directly into “Reclaim the Sun,” the song is seemingly a call for uprising to new glory and gaining control. Later on, there is the seemingly self-titled track “Death is the Beginning,” which provides a look into the struggle of a person suffering the loss of a loved one. A compelling tale, it weaves deep into sadness, but also leads to hope of a future beyond this life. Incorporating piano and delightful vocals from Maiju Tommila to accompany the low guttural lyrics performed by Viljanen, it is a stand out piece on the record. With plenty of meat in between to sink one’s teeth into, other standouts include the synth heavy “Into the Dark,” the epic “The Ghost,” the rapid fire vocals of “In Torment,” and the brighter colored, yet out of place “Agnus Dei.” Complete with a bonus track smack in the middle of the track list called “The Drowning,” the Japanese edition of the album ends with a unique spin on Ricky Martin’s “Livin’ La Vida Loca.” A must have for fans to get their hands on, Mors Principium Est maintain the upbeat tempo of the song, simply adding some deep growling vocals over the intense guitar riffs. Complete with album artwork painted by Eliran Kantor, who has worked with others such as Testament, Iced Earth, as well as Sodom, it conveys the stark outlook of the music with a black and red motif featuring what seems to be death itself looking out over a globe. Overall, Embers of a Dying World is a cohesive album that uses many different tones to evoke the emotions of the listener; emotions of regrets, loss, and the need to move on. Many have compared Mors Principium Est to others from the region, but the creativity is what sets them apart. Fans of Apocalyptica, Children of Bodom, or even Bullet For My Valentine could definitely find a new favorite band in Mors Principium Est. For these reasons, CrypticRock gives Embers of a Dying World a 3.5 out of 5 stars.